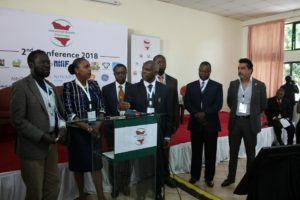 The conference was graced by several dignitaries: Her Excellency Dr. Carol Karugu, Deputy Governor, Nyeri County; His Excellency Prof. Peter Anyang’ Nyong’o, Governor, Kisumu County; His Excellency Prof. Kivutha Kibwana, Governor, Makueni County; Dr. Julius Muia EBS, Principal Secretary, State Department for Planning; Dr. Racheal Kamau, CEC Health, Nyeri County. Rev. Samuel Njenga of the Presbyterian Church of East Africa opened the conference with prayer and thereafter giving a brief address. He said that the church has a vital role to play in advocating for and sensitizing the people about good health. Dr. Kamau welcomed participants and thanked the organizers for choosing Nyeri County to host the conference, adding that she looked forward to fruitful deliberations. “Nyeri County is facing a high burden of NCDs. We need to change our ways of practice and take up the challenge” she remarked. Thereafter Dr. Kibachio Mwangi, the Head of NCD unit at MoH highlighted the key objectives of the conference which were: Understand the NCDs challenge; outline the role of private sector in addressing NCDs; outline the role of consumer organizations in protecting the public from sale of harmful products; and outline the role of government, civil society and the youth in addressing NCDs. Dr. Mwangi emphamphised that NCDs are not purely a health agenda, but require a multi-sectoral approach incorporating sectors such as transport, education and agriculture particularly in prevention measures. “We should put health first; unfortunately what are addressing is a result of our choices such as what we eat. Good health plays an important role in boosting the economy, reducing poverty, increasing education and boosting investment” Dr. Julius Muia said in his address to the conference.Preventive measures against NCDs took center stage in the deliberations. It was appreciated that more focus needs to move to prevention as we continue in disease management interventions. The consensus on the way forward included creating awareness, education of the public and preventive measures against NCDs, adoption of a multi-sectoral approach, utilizing Public- Private Partnerships and supporting local pharmaceutical manufacturers to make medicines affordable and strengthening the supply chain. “Managing NCDs is very expensive. If we truly want to make UHC achievable, we need to address the issue of cost. If we reduce costs we’ll be able to expand the care. The biggest PPP opportunity in cost reduction is in supply chain”, said Dr. Peter Kamunyo, Director, Kenya Healthcare Federation. Further, there was consensus that community health volunteers (CHVs) should be officially entrenched in the health system. It was recognized that CHVs play a very critical role in NCD public sensitization. It was agreed that NHIF be strengthened, that it should cover preventive health checks and that it should ensure that the poor and vulnerable are covered. The country should strategize on addressing the poor availability, lack of affordability and inadequate resources as barriers to UHC. Young people should be informed and sensitized on NCDs so they can act as role models to their peers in NCDs prevention. NCD education should be incorporated in the school curriculum. A patient representative at the conference made an appeal to the health sector to address survivorship of NCDs, a phase of management that insurance doesn’t cover. She highlighted that cancer patients are usually deserted by friends and family after diagnosis due to the burden of their disease on their loved ones. “We are left alone. It’s time for medics to inform us how we can survive after diagnosis of an NCD like cancer. This way trauma can reduce and a patient can accept the situation, love on themselves and even achieve their goals. The price of medications is usually very high and almost unaffordable. Patients get financially drained while trying to get medication”, said Elizabeth, a cancer survivor of nine years. Professor Nyong’o called on stakeholders to identify areas of inequity in health care, and strategize on how to fill the gaps. 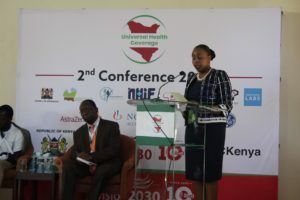 “Counties don’t have a strong primary healthcare system, the aim of UHC is to strengthen primary healthcare” said Dr. Karugu, while Prof. Kibwana called upon all pilot counties to learn from each other as a way achieving UHC uniformly, further adding that CHVs will play a big role in rolling out UHC, particularly in educating communities. The conference was well attended attracting 400 delegates drawn from both public and private health sectors. There was representation from national government, county governments, World Bank, the United Nations office in Kenya, Non-governmental organizations and youth organizations. 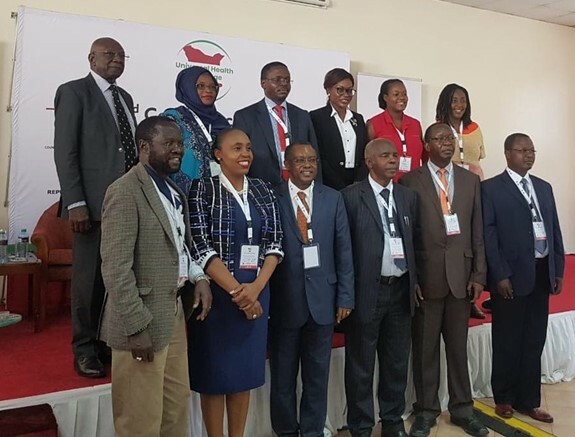 KHF was represented by the chairman, Dr. Amit Thakker, directors Dr. Peter Kamunyo and Dr. Daniella Munene, Dr. Joy Mugambi, deputy Secretary General, Kenya Medical Association (all panelists), as well as several KHF members who attended as delegates. A number of KHF member organizations sponsored the event.